Discussion in 'Safety Razors' started by pcm81, Feb 13, 2019. 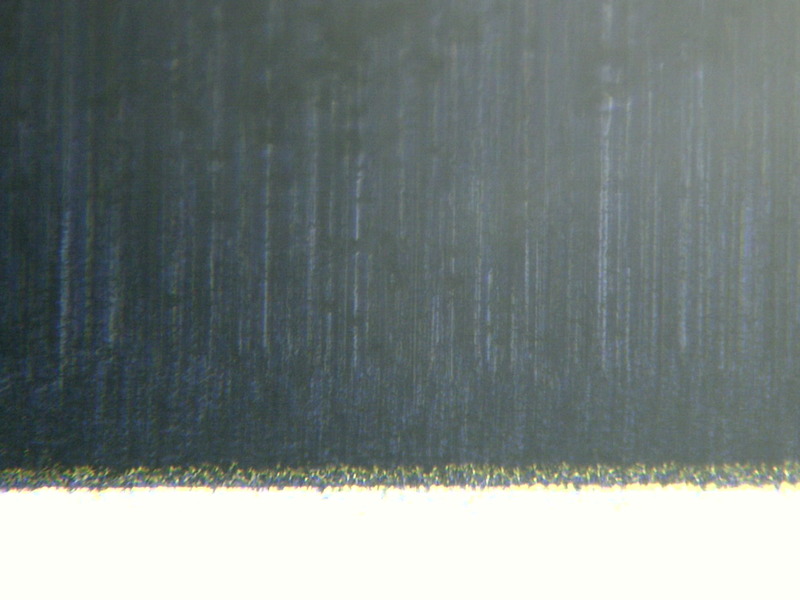 This is what an edge of a brand new, never used, feather blade looks like under the microscope. Width of the picture is approximately 0.6mm of the blade. Edison Carter, RyX, Hembree and 2 others like this. Not sure if I'm interpreting the image correctly. Are there four zones or facets to the edge? As you get closer to the bottom of the image and I assume the sharp edge, the zones get smaller. There seems to be a very fine line at the bottom I labeled "D". Added highlight in blue to make the edge more visable. Edison Carter and Frijolero like this. I guess it's what I would expect to see under a microscope. Feathers have a reputation for being just about the sharpest blade around. I like them but I do find that the blade feels smoother after the first shave or two. I guess that's why some folks use a cork on them, or palm hone/strop them before first use. Unless I get sloppy and nick an ear lobe I have never cut myself with a Feather and I use my Fat Boy on 9. Gillette Silver Blues are another blade I really like. Not quite as sharp as a Feather but a little smoother. brit, Edison Carter, RyX and 2 others like this. Generally speaking, when you sharpen a blade you do it in 3 phases. Grinding - rough stones that get sides generally close. Sharpening, medium grit stones, say 800-2K grit on JIS scale. This is where you form the burr and flip it. This is when the two sides truly meet forming the edge. And third phase is polishing. Polishing is a series of progressively finer grits which are meant to polish the bevel and thin out the burr. If burr is not removed, it forms a wire edge, which is an edge that appear sharp, but is very weak and will fold over after first use. After the two sides of the blade meet in phase 2 you should only be using trailing edge strokes. Using leading edge strokes will rip the burr off before it is thinned out and it will rip the edge off with it. Zone B appears to be the final bevel and zone C on your image is what i'd guess the edge should be but either there is still burr that is folded over or the edge got ripped off with the burr. In all honesty, by my knife sharpening standards i'd call this a crappy edge. Frijolero and RyX like this. You mean a fatboy on 9 with a Feather blade is not a natural born killer!! brit, Frijolero and RyX like this. They are coated blades and it also depends when they put the edge on the blade before or after coating. Feathers do not hold an edge well after the first use which leads me to believe they put the edge on after coating. Some other blades it is the opposite and they actually get sharper after being broken in. Bic Chrome Platinum blades are an example of this. They also hold their edge longer than some other brand blades. Gillette Nacet blades are just as good as the Bics and a little bit more sharper while keeping a consistent edge across multiple uses. One thing I was reminded of yesterday is the geometry of the head of the razor will ultimately make or break your shave not the blade once you have a shave routine that works. I was doing a 30 day rule and messing around with technique not getting the high quality level of shave I am used to with a VDH razor and blade I am not used to which is an Astra Platinum. Yesterday I switched the razor and stopped with the technique tweaks and all of sudden a vastly improved shave. It just took a better designed razor is all. Here is a site where someone did some testing of all this on different DE blades. brit, Frijolero, jimjo1031 and 1 other person like this. Good info there. Thanks for the link! A choice was made here at TSD - there is no DE Blade Forum. Not that it won't be discussed. There just isn't one place to confine that discussion. I'm guessing it devolves into arguments and hard feelings. Getting less sharp after a few shaves is the result of wire edge getting ripped off or folded over. It is my current opinion that feather blades seem sharp, because of not very well polished edge. chemically sharpened??? whats that??? Chemicals can etch a metal, but they cant sharpen something. brit and johnnyflake like this. i find nacets to have consistently smooth shaves first to last. isn't that like engine renewer in a can ..